Professional software development company in Coimbatore. we deliver unique web designs & inspiring solutions. We are very Affordable. Custom Static Website Design and Development. Custom Dynamic CMS Website Design and Development. Custom E-commerce Shopping Website Design and Development. 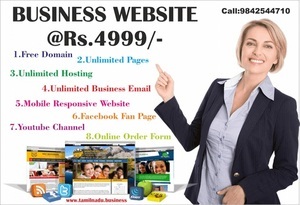 Unlimited Revision of website design. SEO Friendly Website. High Quality Website. E-Commerce. Domain Name Registration. LogoDesign. SEM. Software Development. Content Writing. Bulk SMS. Unlimited Disk Space , Unlimited Sub Domains , Free cPanel , Click Script Installs , Auto Backup Etc,.